>Well it’s all change here. We are getting a dog pup called Oscar but not the pup we saw last night. I’ve been thinking about it all day & his cautiousness, which is due to his lack of socialisation, has put me off. I’d rather a pup who has been raised in a home & used to noises & people rather than a kennel raised pup. As he’ll be living in our home & coming on holiday with us in our caravan, we need him to be confident & happy to meet new people and encounter new situations & I just wasn’t convinced that this was the dog for us. Annie loved him but to be honest she’ll probably love any pup she meets as she’s that sort of dog, especially if it’s a boy. I’ve found another breeder who has 3x 4 month old dog pups & we’re going to see them on Saturday morning. I really like the breeder’s attitude & think that her views on puppy raising are more in line with my own. These pups are used to the sounds of a house, have been handled every day since they were born & know basic commands already. I also liked that she said she vets the potential buyers & sometimes she rejects people if they turn up wearing unsuitable clothes or seem fussy about dirt on their clothes rather than just keen to sell the pups to the first person who shows an interest. However for now enough of dogs as I’m sure the knitters amongst you who aren’t dog mad have probably given up on me recently. But before I can mention the fibre I need to update you all on the DD’s injury. She is going to be ok & IMO doesn’t need an operation She is now walking without crutches & without the splint at home without any problems. She is however wearing her splint at school out & when out just in case she falls & twists it. Her knee is still a bit swollen but she isn’t in any pain which is fantastic. She has another hospital appointment next week but I’ve also made an appointment to see our Doctor tomorrow and hoping that he’ll give her the all clear so we can cancel the hospital appointment. She’s desperate to get back to training & her coach thinks she’ll be back in a few weeks. I’ve been taking her to watch the antics in the pool once a week so she can catch up on the ‘gos & she’s so bouncy it’s unbelievable. 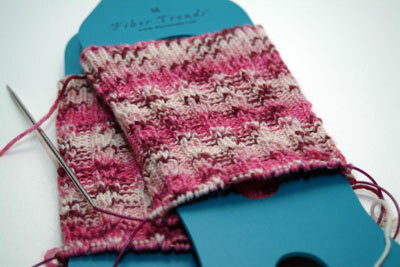 So they were frogged & I’ve started another pair. With everything that’s gone on recently I’ve not been doing much knitting but I am finally happy with the pattern I’ve chosen and a photo will be posted when I’ve got one to show. >Pretty socks, glad you are knitting as it must help with all that stress recently. I hope DD continues to improve. >I’m sure Annie will find a dearheart puppy which is right for her and for you! Sounds absolutely like you are making the right decision – poor almost Oscar. So little socialisation! Good news about DD too. Fingers crossed it all heals quickly! >Sounds like you made the right decision about your new pup, look forward to updates about him! Glad the school have apologised too and that DD is getting better so quickly. >Ooh good news about DD. I hope it all goes smoothly so she can start training again asap.